This was the Christmas for cooking. Admittedly, I was probably a little ambitious with my menu selection. But first, let me back up before diving into that…. This was the first Christmas I spent without seeing my parents. It was hard, and I definitely had my share of emotional moments (Kirk can vouch for that). In part, this was why I wanted to host Christmas for Kirk’s family this year – I wanted to keep my mind off of being without my family. Although I was sad, Kirk was amazing – he took good care of me when I was feeling down, and he showered me with several fabulous gifts for our kitchen. He truly went above and beyond, and made our first Christmas as a married couple truly amazing. I should note that my parents and several other friends also gave me great gifts for the kitchen – my people know me well! So yes, to keep my mind off of feeling sad, I decided to prepare a feast AND make baskets full of baked goods for Kirk’s family to take home with them. Ambitious? Yes. Thursday, December 23: I worked from home and spent the morning cleaning and baking. I baked up a delicious batch of Sparkling Ginger Chip Cookies (from 101 Cookbooks), a nice big batch of basic homemade granola (I like to have fun experimenting with granola – I’ll share this recipe sometime soon), and two mini loafs of Cranberry Walnut Bread. Yum! Each of these items was packaged in cellophane gift bags, labeled, and tied with festive Christmas ribbon. When all was said and done, I had two completed gift baskets and a good sense of accomplishment. I did all of this before 1pm – while cleaning AND staying on top of work. Whew. Following my morning of multitasking, Kirk got home and we went and picked up our meat from the butcher – a nice, beautiful, 10lb turkey breast. The holiday weekend was indeed off to a good start. Friday, December 24: Things did not slow down. I decided to spend the day prepping all of my desserts and getting the brioche dough going. That day I was able to check off the Trifle, the Ginger Pumpkin Tart, and the Dutch Apple Pie. That night I got the brioche dough going, and left it to slowly proof in the fridge over night (it’s second rise). For Christmas eve dinner I made us a creamy seafood chowder with shrimp and halibut, and we watched the 1987 PBS film version of “A Child’s Christmas in Wales”, based on the Dylan Thomas poem/memoir of the same name. My family and I have been watching this movie on Christmas eve for so many years that I can’t really remember when we first started (probably in the late 80s or early 90s?). It seems like we’ve been watching it forever, and I can’t let a Christmas go by without seeing it. We watched it, opened a couple of presents, watched a little bit of “Ponyo” (a Studio Ghibli film – one of my Christmas presents!) and then went to bed. Kirk’s parents and his brother showed up at 2pm, and we somehow managed to eat at 4. It was truly a Christmas miracle. Drinks were enjoyed, food was eaten, presents were exchanged, desert was inhaled. All in all, it was a good party (not too shabby for my first big event as a hostess). Kirk’s family left around 7pm. We checked in with my parents (who have recently discovered the magic of Skype! ), and we finished cleaning up. We finished opening our awesome presents (many thanks to all of you that sent along such thoughtful gifts! ), and we finished watching “Ponyo”. We then fell asleep, and Christmas was over. Paprika, Garlic, and Rosemary Marinated Olives (These were just ok – I might just use garlic and rosemary next time. the Paprika clouded the olive oil). Raspberry-Walnut Brie en Croute served with crackers, sliced pears, and sliced apples (I loved this dish – who doesn’t like melty cheese? I used a modified Paula Dean recipe – one day I’ll share it when I’m able to make it again and take some real pictures). Eggnog with Spiced Rum (Ok – I didn’t make my own eggnog. I know I could have, but that just seemed extreme. I bought some organic eggnog and Captain Morgan’s Spiced Rum. It certainly made for a tasty drink!). Various Wine/Beer (When is wine and beer not good?). Roasted Turkey Breast with butter, garlic, and thyme (This is my standby simple recipe for roasting poultry. Just douse the bird with butter – 1 stick for 5lbs of meat – and sprinkle on chopped garlic and thyme to taste. In the bottom of my roasting pan I coarsely chopped one onion and four carrots and spread them in 4 cups Chicken stock. Yummy delicious). Gravy (Your gravy is only as good as the meat drippings and aromatics you use in your roast. Use the separated drippings mixed with a little flour). Cranberries (made by Kirk’s mom, Stacey!) (These were really good). Brioche Rolls with Cinnamon Honey Butter (I actually made the butter the weekend before) (These are insanely delicious. Perhaps the best part of the meal. I love a good enriched bread – the cinnamon honey butter might have helped a little too). Baked Pineapple (Kirk’s not a fan of this (it’s like a bread pudding, which he has a texture problem with), but I love it, so I make it). Green Bean Casserole (I tried Alton Brown’s “Best Ever Green Bean Casserole” recipe here – it was not that great. Next time it’s back to my cheesy green bean casserole). Brussel Sprouts Gratin (these were OK. I like the taste of fresh brussel sprouts, but next time I might just roast them with some olive oil, sea salt, and pepper). Rosemary and Blue Cheese Mashed Potatoes (This was another winner. I modified Claire Robinson’s recipe from “5 Ingredient Fix” – Wow). Ginger Pumpkin Tart (This was THE BEST pumpkin-based dessert I have ever had. Another recipe modified from Claire Robinson’s “5 Ingredient Fix”). Traditional Raspberry Trifle (my mom always made this when I was growing up. It’s a classic light and tasty standby). Dutch Apple Pie (I actually have yet to try a piece of this pie. Kirk has tried it, though, and he tells me it’s delicious and worthy of making again. Thank you “America’s Test Kitchen”). So for now, since I can’t share every single recipe I made this Christmas, I’m going to start with the one that I thought was the best. Preheat the oven to 350F. Put a 10 inch removable bottom tart pan on a baking sheet. Make the crust by combining the ginger cookie crumbs and melted butter in a medium bowl, until well blended. Add the crumbs to the tart pan and evenly press over the bottom and up the sides. Bake the shell until it has set set and it is a bit darker in color, 10 to 12 minutes. Remove from the oven and set aside to cool. 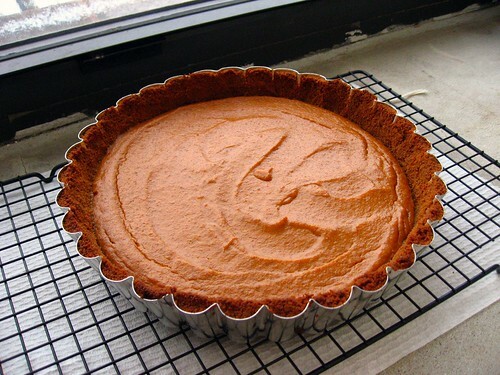 In a bowl, whisk together the pumpkin, condensed milk, pumpkin pie spice, eggs and salt until well blended. Pour the filling into the cooled tart sheel, return the whole thing to the oven, and bake until the filling is set and beginning to brown on the top, about 30 – 35 minutes. Remove tart from the oven, cool to room temperature and then chill in the refrigerator, at least 1 hour, but preferably for a full day. Just prior to serving whisk heavy whipping cream in a bowl (ideally of a stand mixer) until the cream has firm peaks. 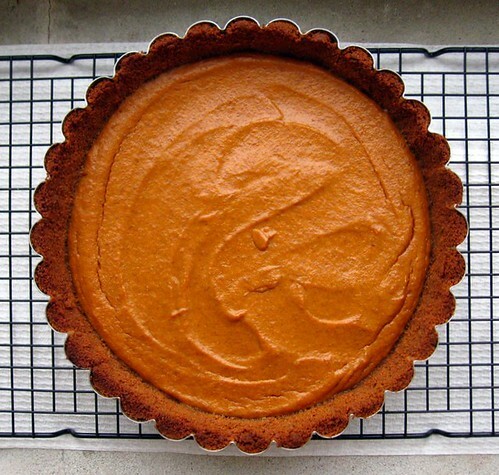 To serve, carefully remove outer tart shell ring and spread the whipped cream on top of the pie and slice. Eat and enjoy! I used a deep tart pan (almost 2 inches deep). So, after pouring the filling into the crust I had nearly an inch of crust exposed. This became the perfect location for my whipped cream. If you use a shallow tart pan, I might suggest dolloping the whipped cream onto the slices just before serving. Any crushed ginger-flavored cookie will do; just be sure to use 2 1/2 – 3 cups crumbs for the shell. If you have leftover sweetened condensed milk (as I did) simply transfer it out of the can into a glass container. Chill it in the fridge and serve a spoonful of it in your oatmeal (though I’ve also read that some people have success with mixing it into their coffee). So, until next time (and please, make this tart – you won’t regret it! ), Happy Holidays! You’re the best cook ever! I love you!!! Thanks! I’m glad you enjoyed it. If you decide to try the tart, let me know how it goes! Oh That looks delish! Was the pumpkin from a can? Sounds very handy. Unfortuately in New Zealand we dont have that. So would it be about a cup and a half of puree? Yep! It was pumpkin puree from a can (very handy indeed). However, if you’re using puree it would be just a little under two cups. I hope you try it and enjoy it!